And they’re not likely to fall any time soon. DRIVERS MAY HAVE seen some respite at the petrol pumps in recent times, but it seems the good times are over – and they’re not likely to return either unfortunately. Figures released by the AA show that after a wonderful period of respite late last year and into January, the cost of keeping ourselves mobile is moving back towards its peak levels. In February prices had plunged to their lowest levels since 2010: €1.28 and €1.22 per litre of unleaded and diesel fuel respectively. The slump was primarily the result of the global oil glut that saw prices falling sharply around the world. With the drop in oil prices having ended in January, the latest numbers show that rates are very much on the way back up. Unleaded prices countrywide now average at €1.39, up 8% from the low in February, with diesel similarly increasing by 7% to €1.31 per litre this month. This equates to roughly €5.00 more for a fill-up of a relatively average sized 45 litre tank. Assuming the tank is filled weekly that’s an increase of €260 in fuel costs per year, quite a substantial hike in just two months. With the euro now practically on a par with the dollar (current exchange rate is 1.05 and likely to fall much lower) the import of oil into Europe is set to become more and more expensive. Having said that, prices still have a long way to go before reaching the crazy highs of September 2012 when unleaded and diesel clocked in at €1.70 and €1.60 per litre respectively. Data from consumer site Pumps.ie shows prices countrywide ranging as low as €1.32 in areas of Cork and Waterford. 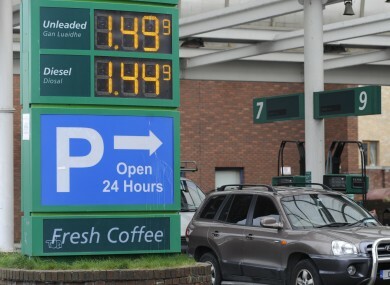 In Dublin, the lowest prices seen are €1.35 on the quays and in Kilmainham, with the most expensive petrol in the city found at Texaco in Finglas, where a litre of unleaded will set you back €1.43. Email “Petrol prices are going up, up, up again...”. Feedback on “Petrol prices are going up, up, up again...”.